When you pen those magical words, “The End”, it’s really only the first step on the road to publication. That first draft needs polishing, revising, editing, but you are too close to your work to do this alone. You need independent, thorough and honest feedback. The kind that digs deep into what’s working and what’s not. The kind that will ruthlessly expose cardboard characters and lackluster descriptions. The kind that will drive transit buses through your carefully-crafted plot. In other words, the kind that hurts. The trouble is that even amongst friends a detailed critique can be hard to take, but blunt and honest critiques are a necessary growth pain for any writer. Venturing into the anonymous jungle of online critique groups in search of tough love is both terrifying and exponentially rewarding. 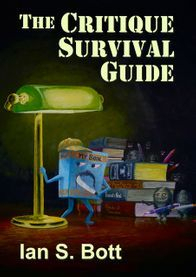 The Critique Survival Guide shares practical tips for surviving - and thriving on - the harshest of critiquing experiences. Non fiction. Published January 2016. Available in e-book formats only.